2 Sheriff's Deputies Are Killed While Eating In A Florida Restaurant : The Two-Way Sgt. 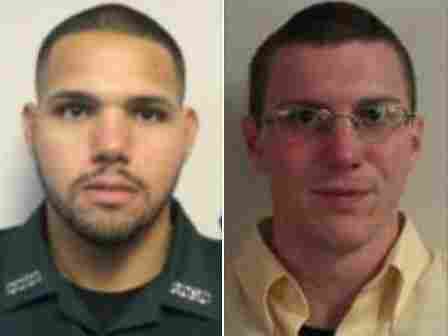 Noel Ramirez, 30, and Deputy Sheriff Taylor Lindsey, 25, were shot through a window. The suspected gunman was later found dead nearby. A gunman shot and killed two sheriff's deputies in a restaurant in Gilchrist County, Fla., on Thursday, in an attack that seems to have come with no warning. Sgt. Noel Ramirez, 30, and Deputy Taylor Lindsey, 25, were shot through the window. The gunman was later found dead nearby. Sheriff Bobby Schultz called the two deputies "the best of the best," adding, "They're men of integrity, they're men of loyalty. They're God-fearing, and they loved what they did. And we're very proud of them." The deputies were on duty and had sat down to eat at the Ace China restaurant in Trenton around 3 p.m. when a gunman started firing at them from outside, the Gilchrist County Sheriff's Office said. "Both our heroes had simply sat down to eat while on duty," the sheriff's office said. "There was no crime in progress, no disturbance. The suspect appears to have walked to the front of the business and shot both men without warning. Two holes in the window are visible tonight." Deputies and others who responded to an emergency call about the shooting found a man believed to be the gunman nearby, dead from a gunshot wound. He was identified as 59-year-old John Hubert Highnote, 59, of Bell, Fla. — a nearby town in the northern Florida county. When a reporter asked Schultz to confirm whether Highnote had committed suicide in his car near the restaurant, the sheriff declined to comment, citing both an ongoing state investigation into the killings and his own perspective. "I want this to be about those deputy sheriffs, I think that you can respect that," Schultz said at a media gathering late Thursday afternoon. He added, "The world's full of cowards, and the world's full of heroes. We need to highlight those heroes, and what they gave." Ramirez was a seven-year veteran of law enforcement who had a wife and two young children. Lindsey had worked with the force for a total of more than three years; he had recently returned to working at the sheriff's office. "It was just surreal" to get the call about the attack on the deputies, Schultz said. He added, "Whether you're a large agency or a small agency, it hits you like a ton of bricks." A possible motive for the shooting has not been released. Twice during his media briefing on Thursday, Sheriff Schultz mentioned negative public attitudes about law enforcement officers. "What do you expect happens when you demonize law enforcement to the extent that it's been demonized?" he asked at one point. Schultz added, "The only thing these men were guilty of was wanting to protect you and me. They just wanted to go get something to eat. And they just wanted to do their job." The department has received numerous condolences and messages of support, including from President Trump, who said, "My thoughts, prayers and condolences are with the families, friends and colleagues" of the slain deputies. Florida Gov. Rick Scott said, "My wife, Ann, and I are heartbroken by the loss of two law enforcement officers in Trenton," adding that he has committed state resources to help the Gilchrist County Sheriff's Office. Scott added, "It is true evil for anyone to hurt a law enforcement officer, and in Florida, we have zero tolerance for violence, especially against the police."